it’s harder to love when it’s easy to hide. Large tracts of land like wide streets be damned, I’m having a get together, an intimate gathering of the virtual sort. 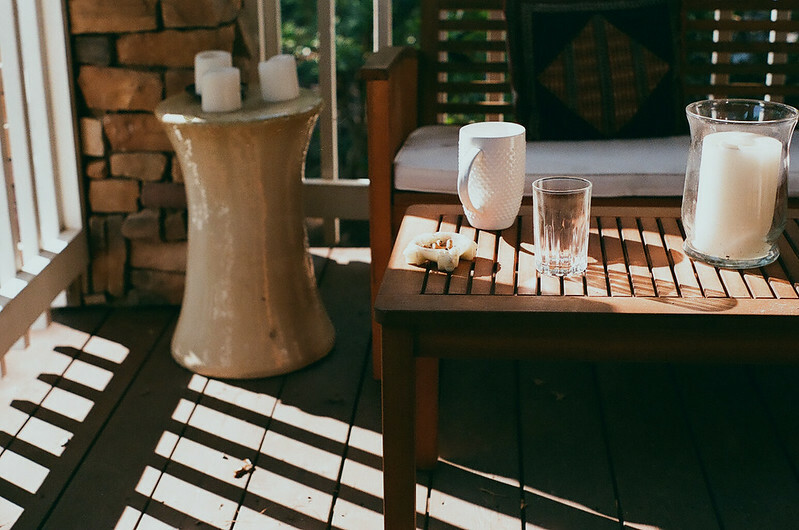 A few weeks back I was talking with some lovely women that live an unfortunate distance from my little bungalow in Tennessee, Sarah (of The Vanilla Bean Blog), Stephanie (of Desserts for Breakfast), and Hannah (of Honey & Jam), in the virtual town square (a.k.a. 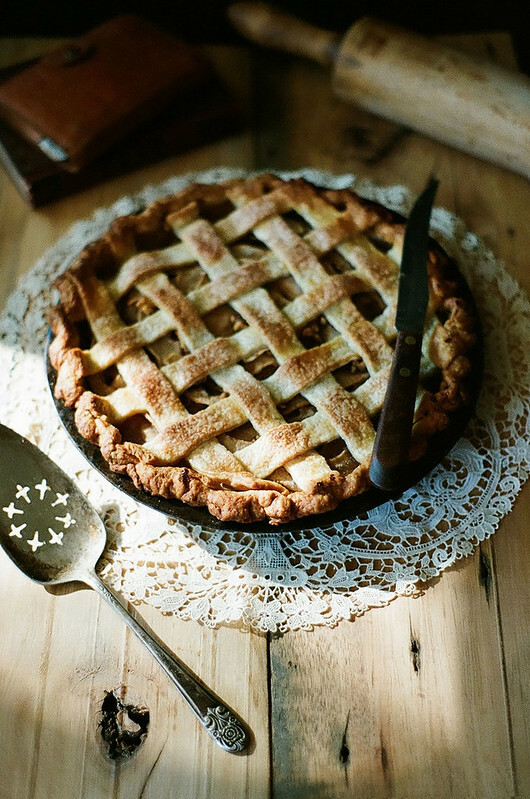 Twitter) about pie, the wanting, the baking, and the sharing of. We wished we could get together over pie, real pie. I still do. And I hope to, hope to trade crust secrets, listen to an endless shuffle of records, collectively pine for vintage medium format cameras, to talk with that abandon one discovers when conversing with people who share your passions. A “virtual pie party” hosted on each of our sites was proposed as the next best thing to being able to sit down face-to-face. So I gathered floral, honey scented pears from River Ridge Farms at the market (quite unlike any pears I’ve ever had, unparalleled really), made a crust of leaf lard from Link 41 & Cruze Farm’s buttermilk, and churned up some toasted oak & caramel ice cream with milk from Fall Creek Farms and eggs from Tant Hill. In case we need to do this thing à la mode, you know. Pie cooling and kettle on, we gather on the front porch, where already a jack-o-lantern roosts and it smells of burning leaves. 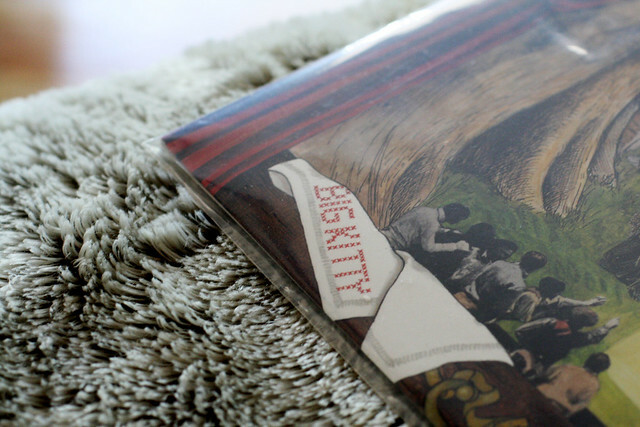 The living room window is wide open and the psychedelic blue grass of Big Kitty, the stalwart collaboration of some friends & local musical luminaries, spins on the turntable in the sitting room, all mewling heart strings, fiddle grit, and that Appalachian timbre, the back of beyond love & misery. 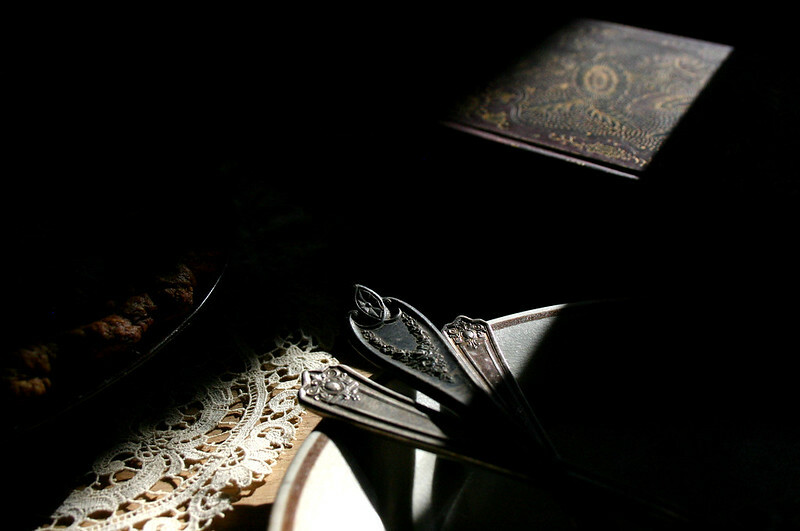 Slices of pie are doled out still warm with ice cream dripping lasciviously down the sides , and we talk over the hushed clink of forks and mugs of coffee or tea, whatever your poison be. You hear it all the time, the surprise and gratitude with which people talk about the friends they’ve come to know through this idiosyncratic enterprise of the “food blog”. Well, I’m the new kid on the block, and I have to say, already, it’s so. You see, I’m a homebody, a book worm, a girl that likes to hide behind the lens of the camera and finds the company of her life-mate to be sufficient most days. My favorite haunts are my bed, porch, bath, and kitchen. Going out to me means the farmer’s market or the grocery. I can’t abide small talk. The only partying I do is of the dinner (or pie…) variety. As a fellow blogger once said, I think I have more types of flour in my pantry than friends. This is just so and how I like it, quality over quantity, and this is why getting to know people through this space has been so satisfying, in short, they are fanatics of my variety that not only share my enthusiasm for photography and food but art of all kinds as well. Quality folks, indeed. 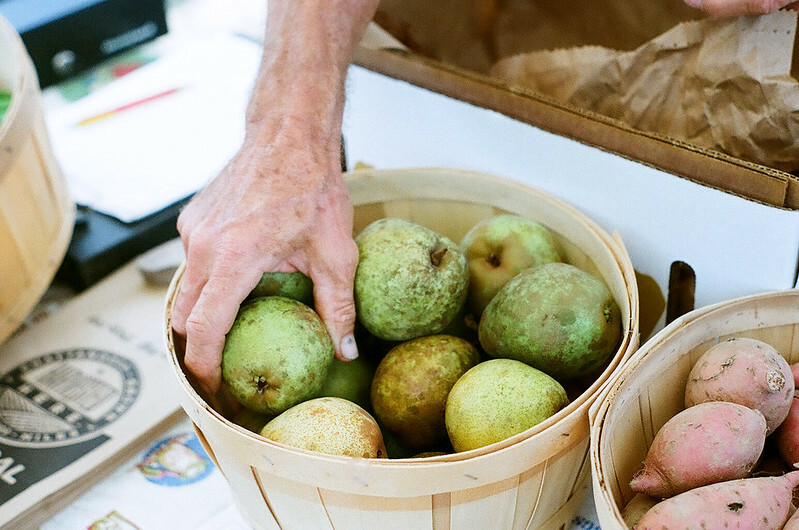 From local pig fat to buttermilk, pears to raw milk to fresh eggs, the front porch to Dixie ballads, this afternoon pie is a little bit of Tendernessee from me to you. This is my new favorite pie crust for sweet pastries (and for savory, simply omit sugar). If you don’t have a stand mixer the crust can be made the traditional way by simply mixing all the dry ingredients, cutting in the cold fat with a pastry cutter until it resembles course meal & no pieces larger than pea sized remain (there should be pieces of fat left though), and then mixing the buttermilk in until it just comes together when pinched being careful to not overmix. Combine 1 1/4 cup (about 156 g) flour, sugar, and salt in the bowl of standing mixer. Set aside the other 1 1/4 cup flour. With the mixer on low add the diced cold butter and bits of cold lard a handful at a time. Mix until thoroughly combined. Add other half of flour. Mix until just combined. Add buttermilk and mix until dough just comes together. Divide dough in half. Place each half on a piece of plastic wrap, form into a disc, and chill at least to two hours (preferably 3) and up to one day. Dough can be frozen, wrapped tightly, up to three months at this point. The gorgonzola and orange blossom water give what would otherwise be a rather rote filling a lot of personality. 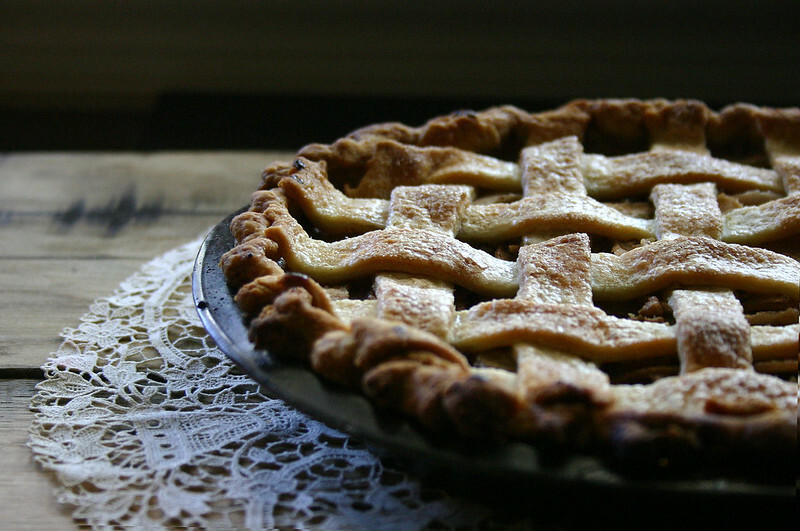 The traditional salty-sweet combo fares great in this sweet pie. 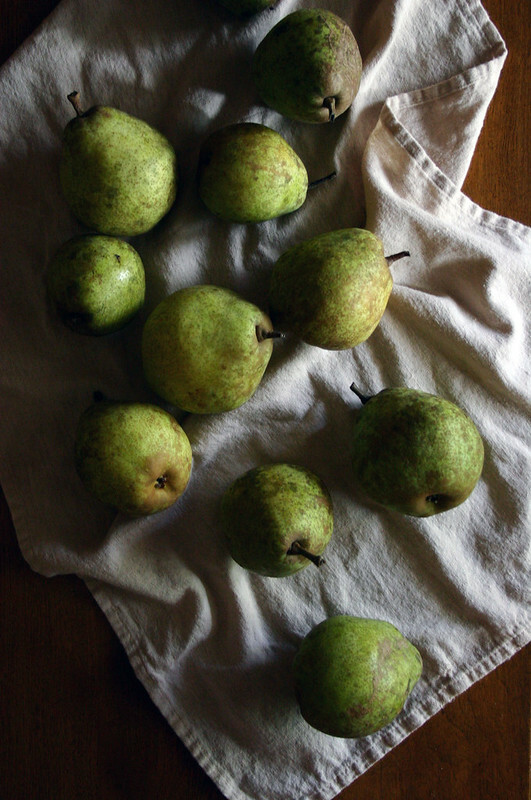 Toss pears with the lemon juice and orange blossom water once sliced. Mix sugar, dark brown sugar, salt, cayenne, cinnamon, and cornstarch in a bowl to combine. 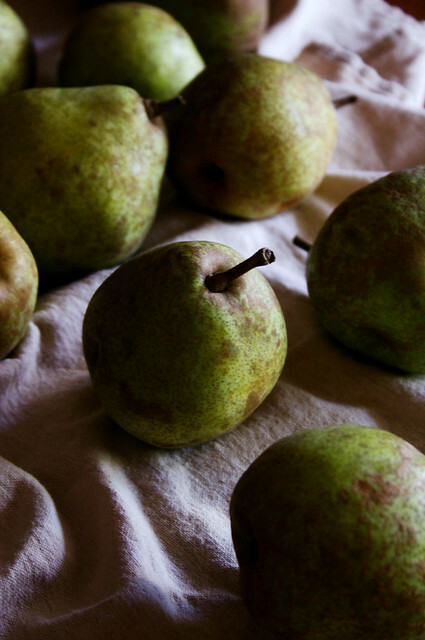 Toss the pears to coat with the sugar and spice mixture. Roll out one half of the crust to fit the bottom of a 9″ pie pan. Place dough in pan, trim edge to 1″, tuck under, and crimp. 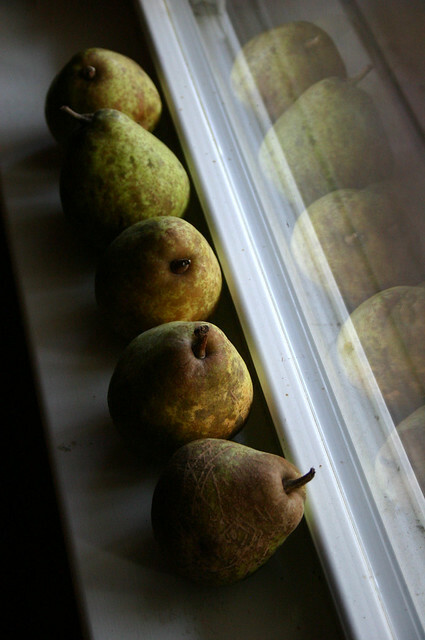 Fill the crust with layers of pears, sprinkling between layers with the toasted walnuts. Once the pie is filled, dot the top with gorgonzola cheese (if using). Top pie with the other half of the pie crust. You can do any sort of design you like or just do a simple double crust. (This Martha Stewart how-to is a great resource for decorative pie crust ideas.) Brush top crust with heavy cream and sprinkle with turbinado sugar. Bake for 15 minutes at 425° and then reduce the heat to 375° and bake for another 30-40 minutes or until the crust is golden and the filling is cooked through. After the first fifteen minutes, I use a crust shield on the edges of my pie to prevent it from getting too brown or burning. You can simply place aluminum foil over the outer crust to achieve this as well. 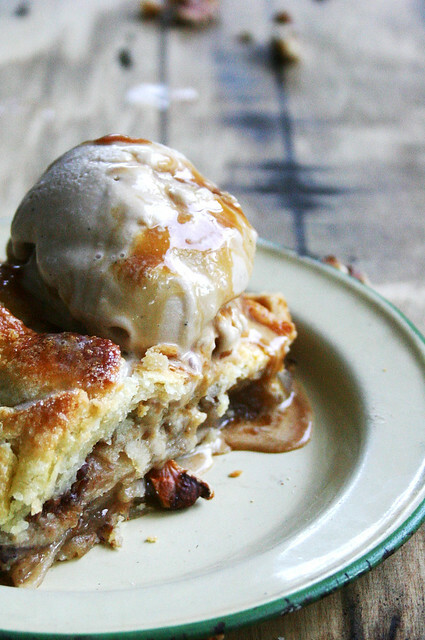 Cool on a rack & serve with a scoop of homemade oak & caramel ice cream for autumnal Tennessee in dessert form. Best shared, naturally, with friends. pie is a powerful phenomenon, and you have done it justice! 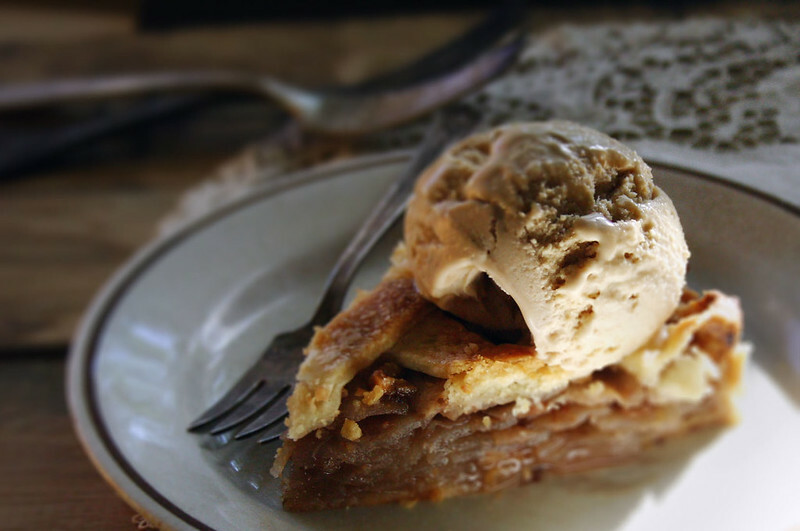 your pie + ice cream look just gorgeous, and it’s a cloudy, windy day where i am – perfect pie conditions. also, your taste in music is scarily similar to mine. 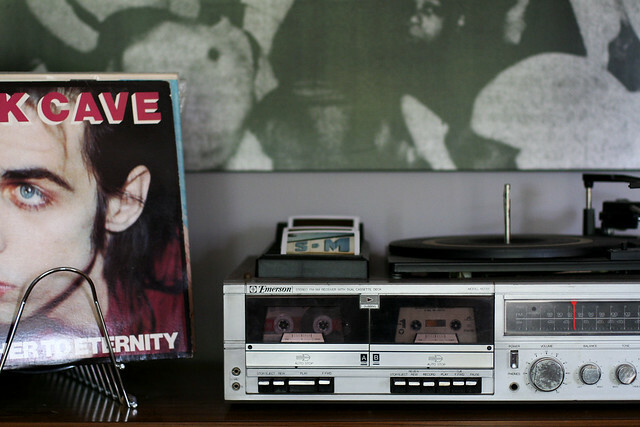 cave, cohen and neutral milk hotel are some of my favourite musicians/ poets/ geniuses. 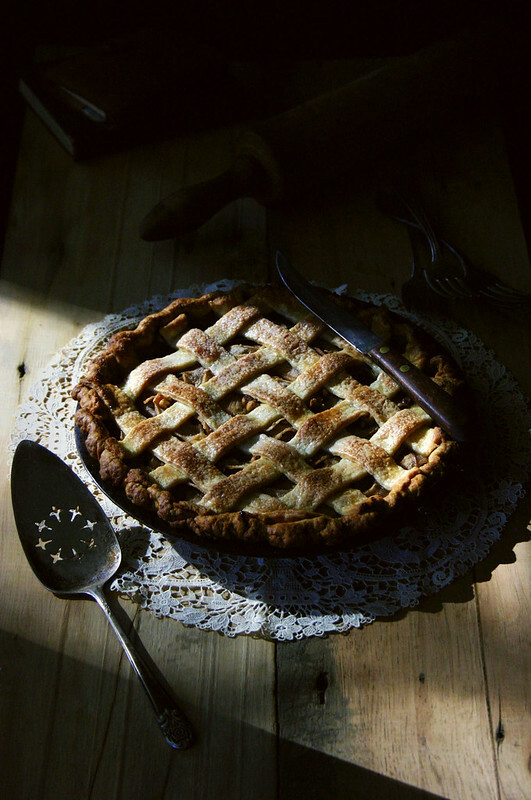 I love the way the light falls across the pie in these pictures. 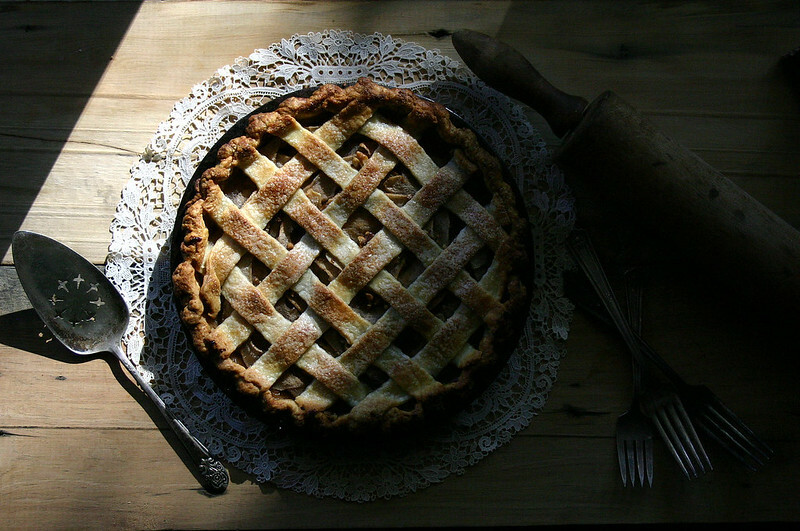 You’ve captured more than just a pie with your camera. Being fundamentally lazy, I love a pie crust that I can make in my mixer. Will be giving this one a go. 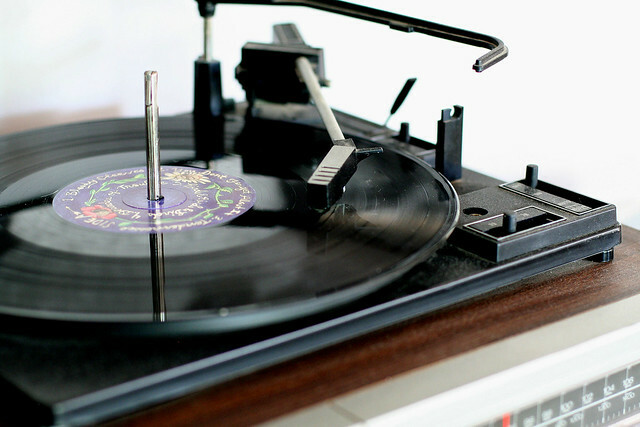 Oh, vinyl! Be still my heart. And Nick Cave! If his voice doesn’t kill you, his words will. Le sigh. 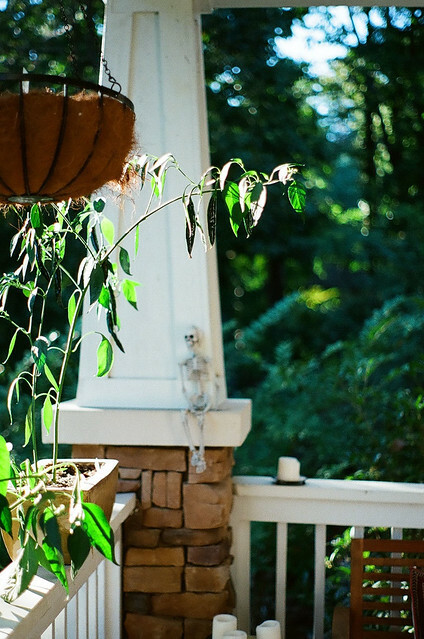 Your photos feel like fall – so cozy and welcoming, I could get lost in them. And that pie, cut me off a piece, will ya? I was having a similar discussion with my life-mate, this afternoon. As I’ve gotten older, I’ve craved friendships with honest, genuine beings. And although I’ve realized those types are few and far between, they’re the greatest company to keep. Quality over quantity, indeed. Oh goodness. I want to come to your pie party! The colors, the textures, the music! Swoon. Gorgeous photos, Beth. 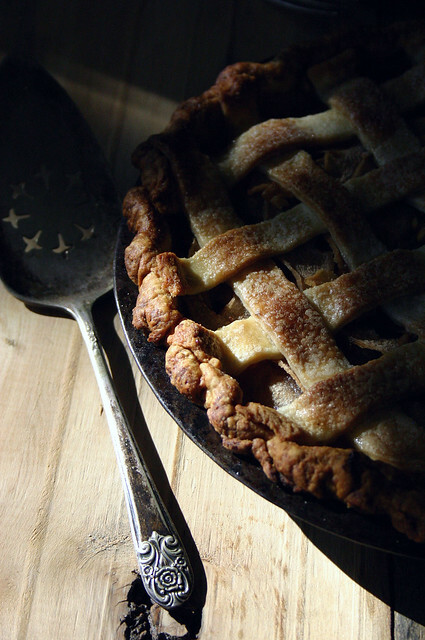 I don’t have the patience for pie but I could most certainly go for a big slice of this one. Wow, this recipe looks amazing, but the puctures… they are stunning! I am not even a pie person, and I am completely take with this. 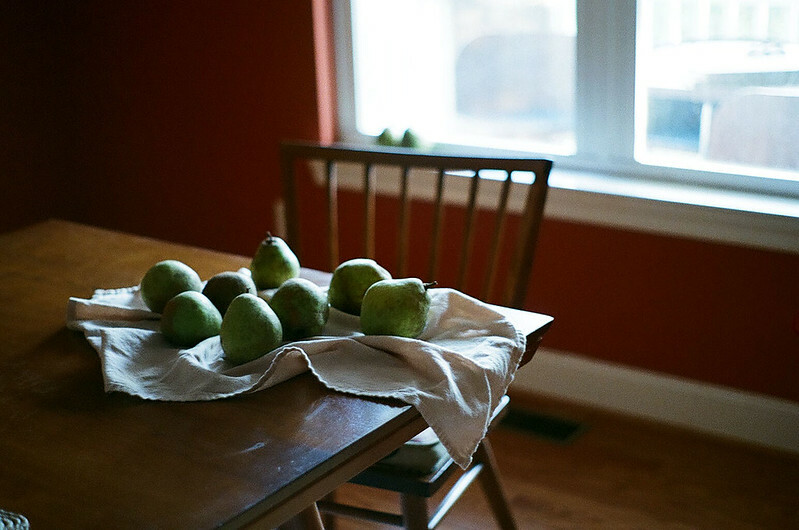 Echoing all the other sentiments above: wow, that light, that lattice top, those pears. Goodness. I love this pie! 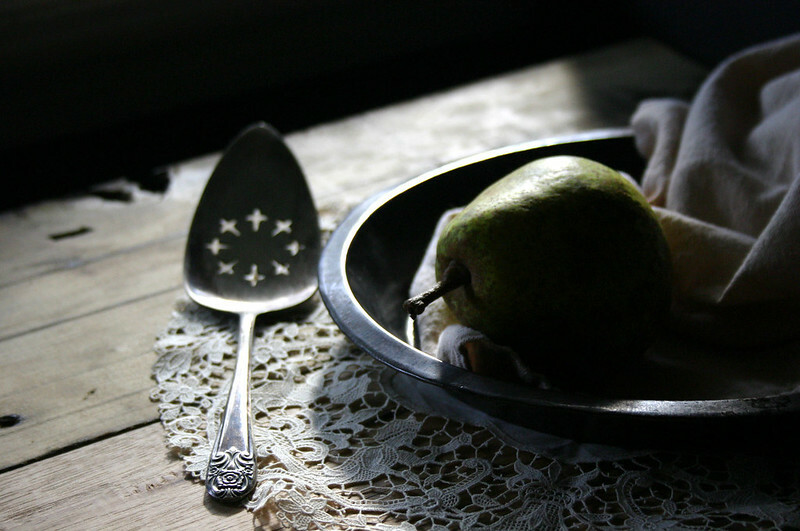 Pears are great the way they are, and adding SPICES and good old American spirit always makes it a bit tastier! Thanks! PS If you don’t mind me asking, what setting on your camera did you use? I love the pictures, and am wondering how you play with the lighting and the camera… Thanks! I use manual setting and play around with various exposures and apertures. I tend to “under expose” in high contrast lighting situations to get the light looking more natural. I haven’t wanted pie in a while, but man do I ever want some right now. 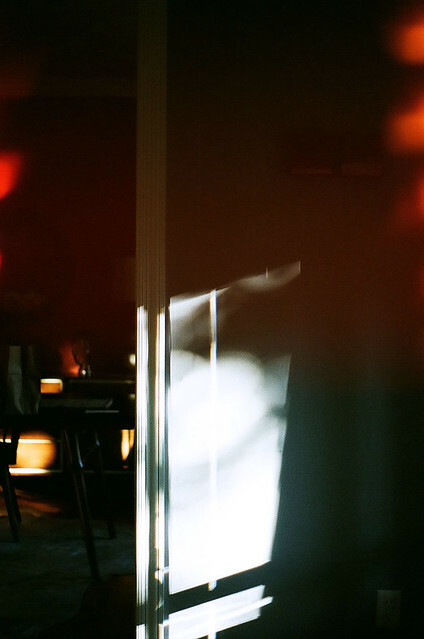 Beautiful photographs…love how you embrace the crazy light. Looks divine! 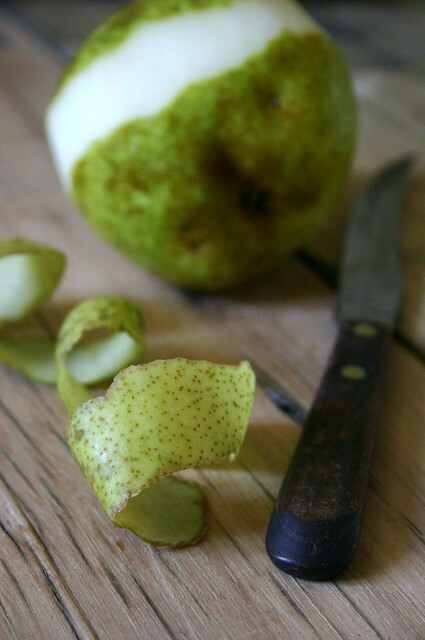 I love love love pears, this is a must-make for me. Beautiful photos as well! Those pics are really pretty. 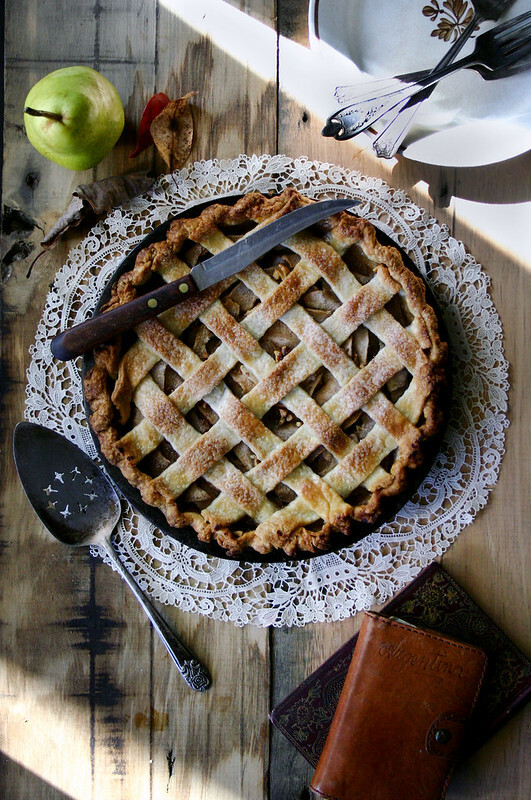 love the pictures and the pie, can’t wait to try out the recipe!! Hi Beth, you’re an amazingly talented baker, writer and photographer. I’ve never been to Tennessee (I live in Australia) but seeing it through your eyes makes me want to pack up and venture to the American South right away! Thanks for sharing your recipe. I look forward to journeying and cooking with you, albeit symbolically through the blogsphere! 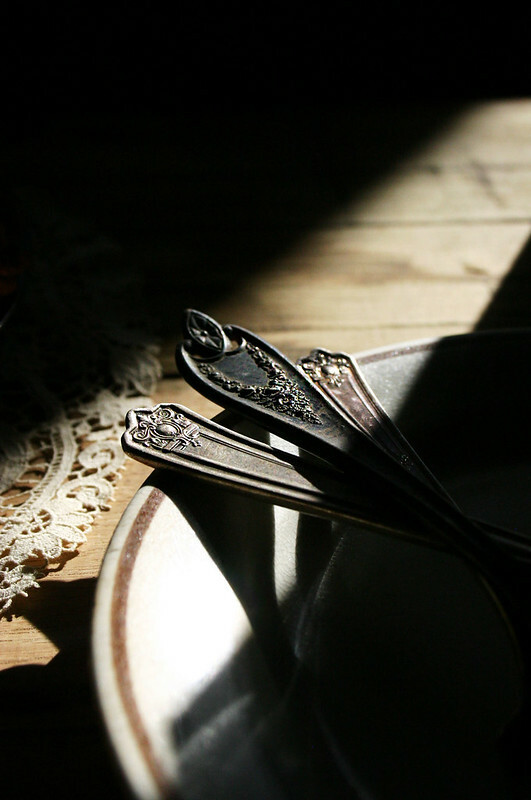 Do you find a difference in the texture of your crusts if you use white lily flour versus gold medal or king Arthur? But it’s expensive. So I most often use 365° (whole food’s brand) unbleached AP Flour. It makes a great ol’ crust. I’ve never used gold medal, at least not in recent memory. 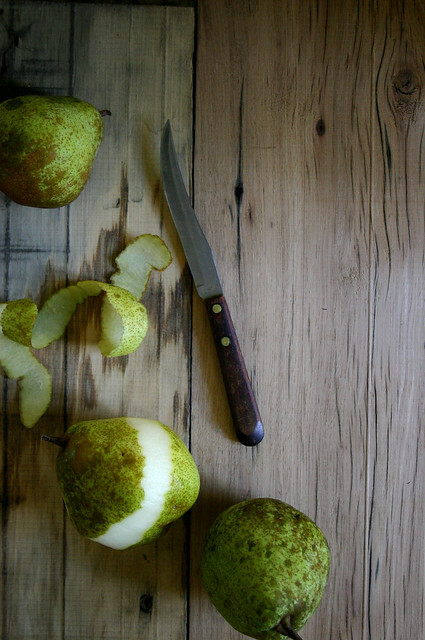 i just came across your blog after looking for a good pear-gorgonzola tart recipe. it’s so wonderful! i love the pictures and the layout, and just all around super pretty. I hope to keep reading more of your stuff! Which stand mixer attachment do I use for the crust?